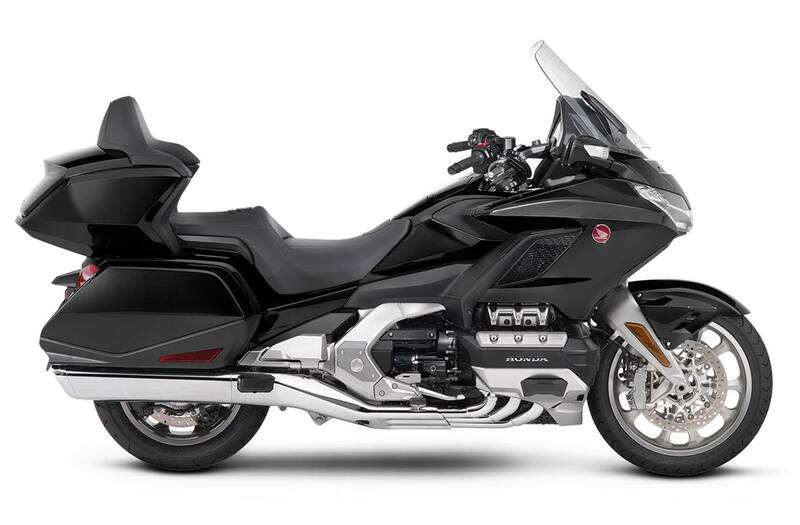 Iconic Styling: Front to back, the Gold Wing sports a lower, swept-back touring design and a strong shoulder line - giving the bike an all-over premium styling and frame. 2018 Model Shown. Advanced LED Lighting: The LED headlight and rear LED tail light design help deliver brilliant brightness and distinctive good looks that are sure to get noticed, along with angular mirrors with integrated self-cancelling LED turn signals. 2018 Model Shown. 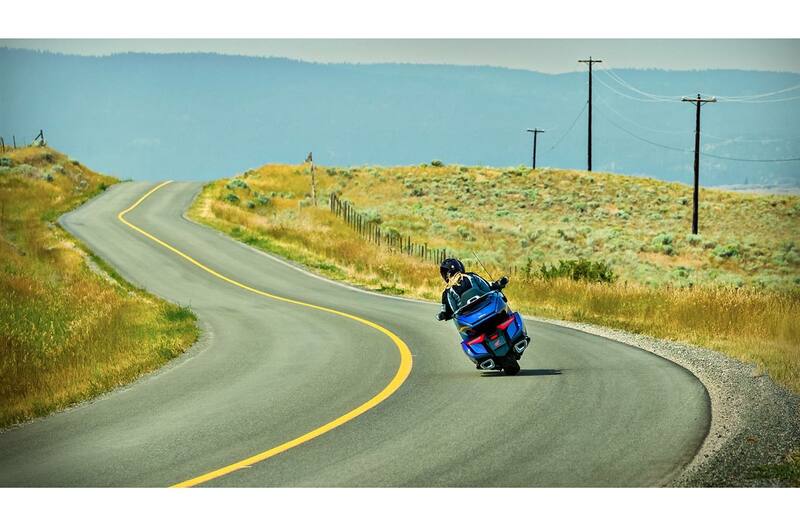 Adjustable Electric Windshield: Every touring rider can appreciate the extra wind and weather protection with the integrated and fully adjustable electric powered windshield - effortlessly changing height to suit your preference. 2018 Model Shown. Electronically Controlled Front Suspension: Underneath it all is an electronically controlled front end suspension, allowing for a responsive ride and even better handling. The chassis also contributes to an 80-pound weight reduction from older models. 2018 Model Shown. 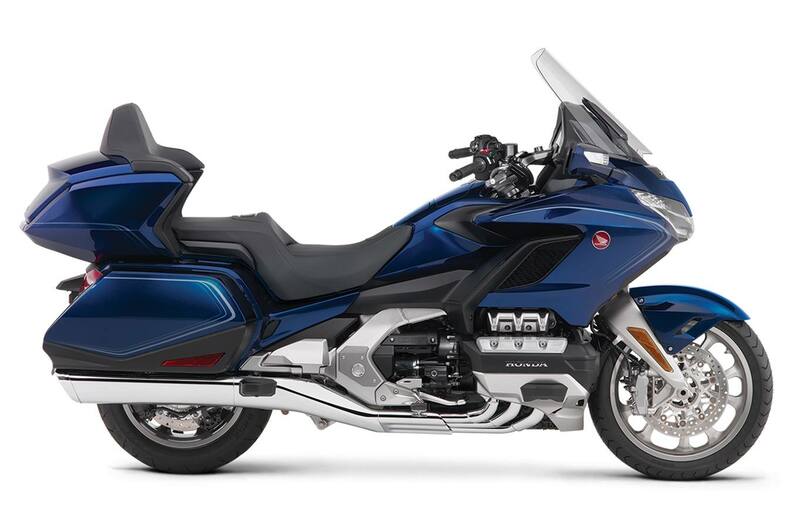 Removable Trunk Storage: While the Gold Wing features legendary comfort and handy storage capacity, it also goes beyond with a removable rear trunk. Ideal for shorter trips, solo riders or those seeking a sleeker look, the choice is yours. 2018 Model Shown. Upscale Wheel Design & TPMS: The attractive wheel design adds to the overall upscale styling, connecting to the road with a wide 200 series rear tire with standard Tire Pressure Monitoring System (TPMS). 2018 Model Shown. Apple CarPlay® with Siri: Take the things you want to do with your iPhone and put them right on the Gold Wing's built-in display with Apple CarPlay®. Get directions, make calls, send and receive messages and listen to music through onboard controls or take advantage of Siri Voice Recognition. 2018 Model Shown. 7-inch Navigation & Audio LCD Display: The Gold Wing's dashboard features an intuitive 7-inch LCD display, housing the Honda Satellite-Linked Navigation System™, designed to help you find the best way to your destination. Additionally, the dashboard comes with premium audio, Sirius XM® satellite radio and a host of exciting technology. 2018 Model Shown. 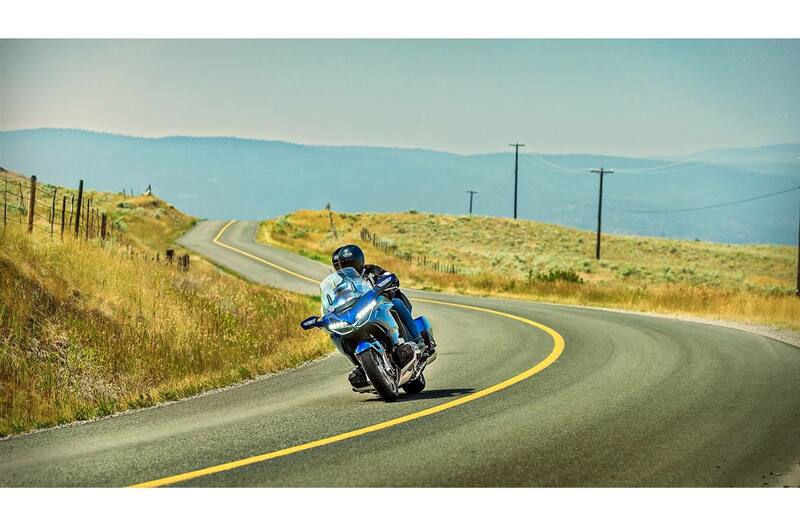 Standard Bluetooth Connectivity: Seamlessly connect electronic devices via standard Bluetooth connectivity, available on all Gold Wing models to conveniently enjoy MP3, iPod and USB integration right at your fingertips. 2018 Model Shown. Smart Key Fob: For those seeking the ultimate convenience and security - this smart key fob never has to leave your pocket. 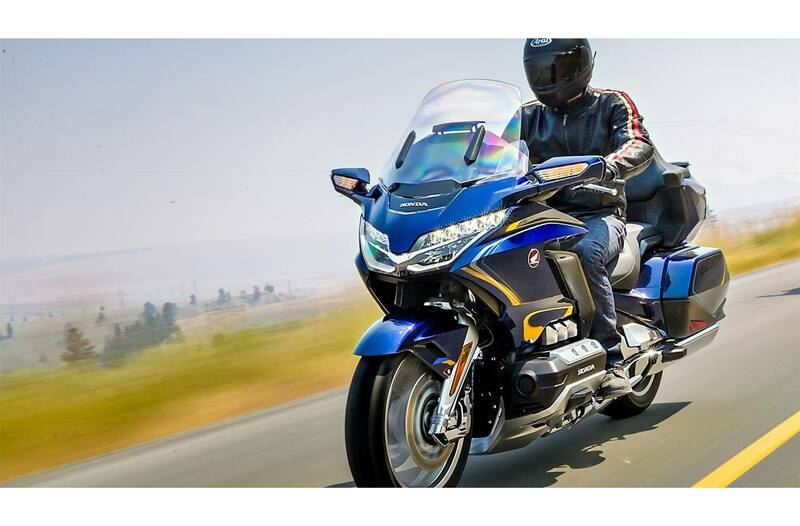 The Gold Wing uses a proximity-key system to conveniently open storage compartments and start the bike at the touch of a button. 2018 Model Shown. 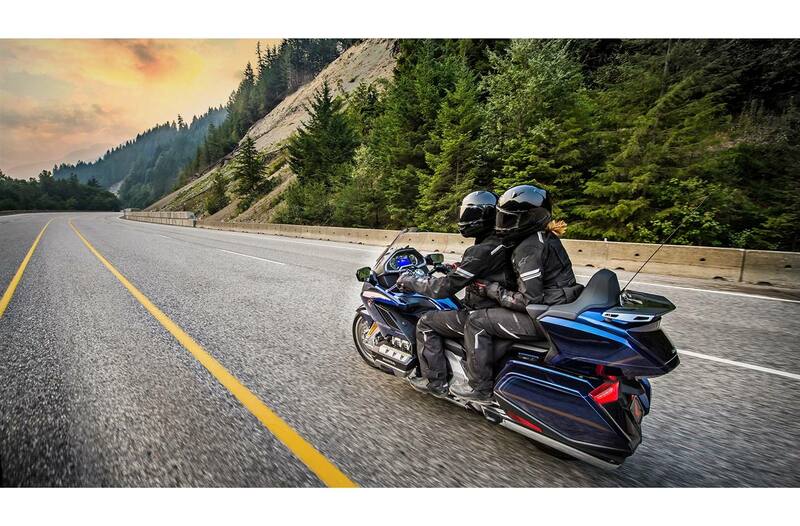 Responsive Engine and Powertrain: The Gold Wing is powered by a flat six-cylinder motor with four valve heads. It offers increased power designed to go beyond the demands of the open road and deliver an incredibly responsive touring experience. 2018 Model Shown. Selectable Riding Modes: Switch between four Selectable Riding Modes to easily find the power and performance to match your preferred riding style or road conditions. Choose between Sport, Touring, Econ or Rain modes to automatically adjust between engine, suspension and braking settings. 2018 Model Shown. Advanced Ride Technology: The true moto enthusiasts in you will appreciate the responsive throttle by wire and traction of Honda Selectable Torque Control (HSTC). Plus, long distance rides just got more comfortable, with electronic cruise control, heated grips and both front and rear heated seats. 2018 Model Shown. 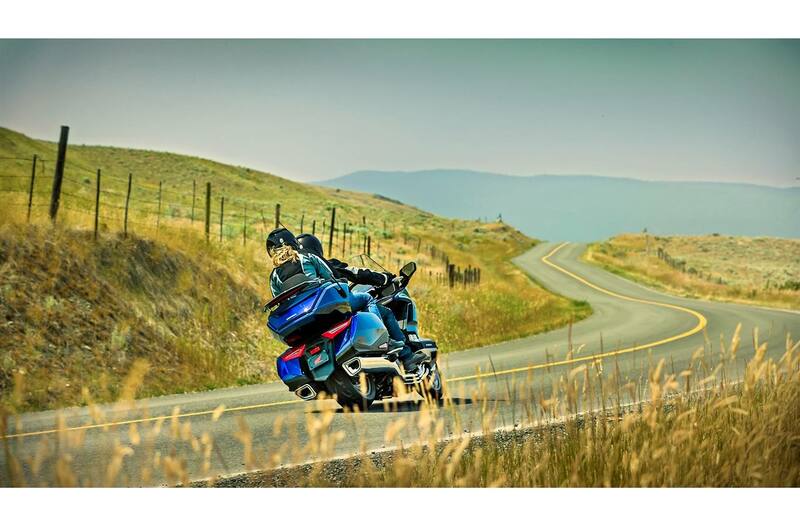 Six-Speed Transmission and DCT: The Gold Wing offers a choice between a more traditional six-speed manual transmission or a technologically advanced seven-speed Dual Clutch Transmission (DCT) - making the iconic Gold Wing one of the most groundbreaking touring bikes ever made. 2018 Model Shown. Forward / Reverse Walking Speed Drive: The Gold Wing offers walking speed reverse gear, while also featuring a walking speed forward gear that's only available on DCT-equipped models. 2018 Model Shown. Front suspension: Double wishbone with Showa shock absorber 109 mm (4.3 in) travel. Brakes: Front dual 320 mm discs with radially mounted six-piston Nissin calipers Rear single 316 mm disc with three-piston Nissin caliper and electronically controlled Dual combined brake system (CBS) with ABS. Warranty: 3 year, unlimited mileage, freely transferable warranty; extended coverage available with Honda Plus. Specifications, features, illustrations and equipment shown are believed to be correct - however, accuracy cannot be guaranteed. Honda Canada Inc. reserves the right to make changes at any time, without notice or obligation, in colours, specifications, accessories, materials and models. Some vehicles are shown with optional equipment. Some vehicles shown are U.S. or European models. Canadian specifications and models may vary. Double wishbone with Showa shock absorber 109 mm (4.3 in) travel. Front dual 320 mm discs with radially mounted six-piston Nissin calipers single 316 mm disc with three-piston Nissin caliper and electronically controlled Dual combined brake system (CBS) with ABS. 3 year, unlimited mileage, freely transferable warranty; extended coverage available with Honda Plus.